Last week when I posted about making some baked mac and cheese, I got a lot of request on wanting to know how I made this. I can't take credit for this recipe because it actually came from Shayne. It's by far the best baked mac and cheese I've ever had! It's also really simple to make! Cut all of the cheese into cubes. Once Macaroni is ready, pour macaroni into a baking dish. Reduce heat to 400 degrees. Yum! 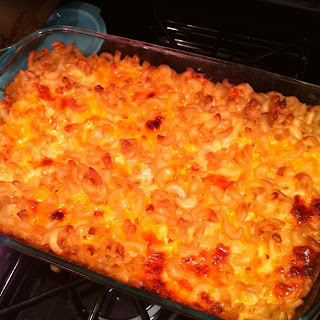 I love a good mac and cheese...will have to try this one out! Yummm!! Mac and cheese is my weakness! I can take all the calories out of this, right? Wow, looks so delicious. I would never have guessed that it needed to bake in such a hot oven! I'm totally going to make this! I love Mac & Cheese!